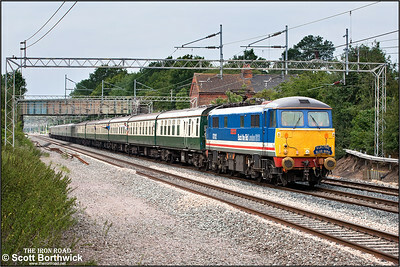 This gallery illustrates Class 87 locomotives working services operated by GBRF. 87002 'The AC Locomotive Group' passes Cathiron with 325002+325017+325015 in tow forming 1S96 1626 Willesden Railnet-Shieldmuir RMT on 05/04/2006. 87019 'ACORP Association of Community Rail Partnerships' hauls 325002+325015+325014+325009 forming 1S96 1626 Willesden Railnet-Shieldmuir RMT at Cathiron on 10/05/2006. 87022 has 325013+325007+325012+325011 in tow running alongside the Oxford Canal at Ansty whilst working 1S96 1626 Willesden Railnet-Shieldmuir RMT on 11/05/2006. 87028 passes Cathiron with 325004+325007+325006 and 87022 in tow forming 1S96 1626 Willesden Railnet-Shieldmuir on 02/06/2006. 87012 'The Olympian' proudly displays its 'Host City London 2012' branding as it speeds northwards at Grendon with 325006, 325007 & 325004 in tow forming 1S96 1626 Willesden Railnet-Shieldmuir RMT on 08/06/2006. 87012 'The Olympian', adorned with Saltires on the buffers, passes Cathiron as it heads 1S96 1626 Willesden Railnet-Shieldmuir RMT formed of 325011, 325015 & 325001 on 30/06/2006 . 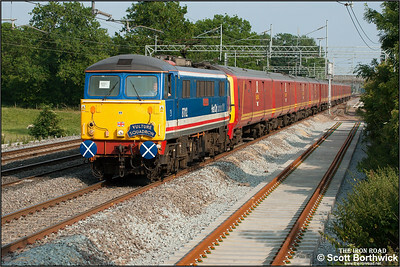 This was 87012's penultimate working in the UK prior to export. Well done to the guys responsible for turning the loco out in this condition. The notice in the window read Goodbye 87012. 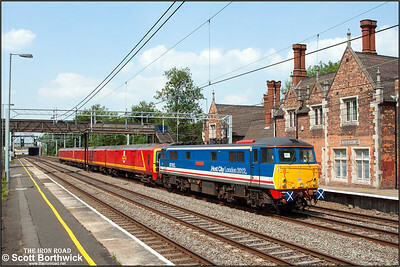 87012 'The Olympian' drags 325005 through Atherstone working as 5Z48 0940 Polmadie-Wembley on 03/07/2006. 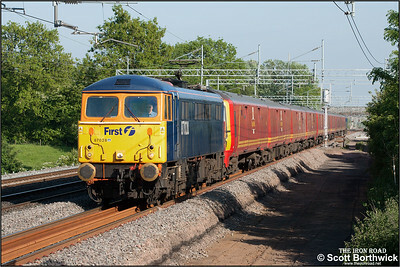 This was the final working for 87012 in the UK prior to being exported to Bulgaria. The notice in the window read Goodbye 87012. 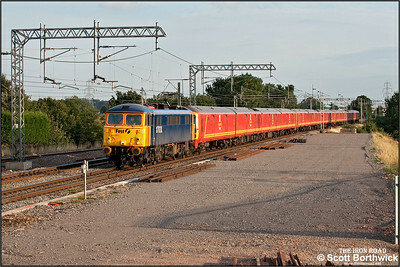 87028 catches the last of the evening sunshine with 325011, 325001 & 325016 in tow whilst forming 1S96 1626 Willesden Railnet-Shieldmuir as they approach Attleborough Junction, Nuneaton on 22/08/2006.